Jamaica Plain, or “JP” as it’s commonly known, is a vibrant Boston neighborhood bordering Brookline, Chestnut Hill, Mission Hill and Roxbury. The premier district in JP is known as “Pondside”, which includes beautiful mansions and houses between Centre Street and Jamaica Pond. This diverse community is reflected in the myriad shops and restaurants along Centre Street, the main commercial area in JP. From Centre Street, it’s a short walk through the “Pondside” district to Jamaica Pond and Emerald Necklace park, designed by Frederick Law Olmsted. 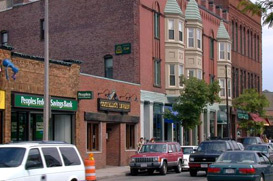 Housing in JP is characterized by smaller condo buildings and single and multi-family homes. Many of the single family homes are stately mansion style Victorians. The largest complex in JP is Jamaica Towers, a 273 unit coop building on Jamaica Pond. Another larger development is Cabot Estates, a sprawling and bucolic gated community on the far side of Jamaica Pond. Vanguard Realty’s Brookline Village office is minutes from the center of Jamaica Plain.